Event Description : EXHIBITION : Anu Bajaj Director of Gallery Art Positive presents "Vocabularies", a group art show of three young women artists Shaila Nambiar, Sarika Bajaj, Kruti Thaker connected by a shared interest in bringing artworks alive with their unique choice of materials. 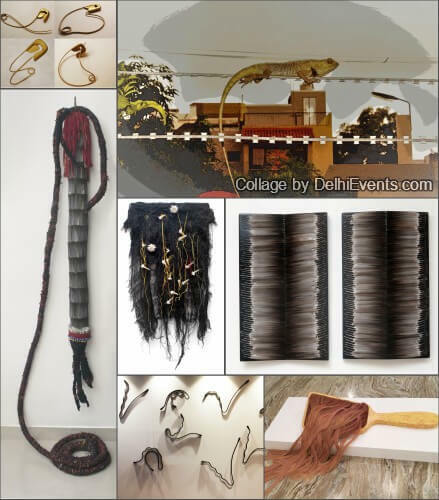 The exhibition will be a congregation of 14 artworks crafted in metal, fabric, feather and threads. This insight into the wildly imaginative nature of the artists' storytelling and the artistic vocabularies stands apart due to their use of unusual material and the process of “making," which is an important, almost meditative process for both the greater and the spectator. While all three artists look to their surroundings both social and natural there is a something ethereal and unique in each of their art style. Sarika up-cycles found feathers, fabrics and shells to create ephemeral art works and sculptures that build on ceremonial and ritual ideas. Her works draw inspiration from nature and are a comment on ecological concerns. Hyderabad based artist Shaila Nambiar on the other hand draws her inspiration from everyday objects like a bobby pin, a safety pin, a hair brush et al are to make her audience think about notions of beauty thrust upon women. Kruti Thaker’s work engages the beautiful and intricate art of patchwork and embroidery transforming it into a contemporary form and presenting an almost surreal reality. ‘Vocabularies’ encapsulates the artistic journeys of these young artists. For all three artists the praxis itself manifests a behavior that pushes them into a state of enquiry and concern. The process is very evident in each of their work, and unfolds itself to the spectator. Each piece can be subconsciously deconstructed and traced back into pieces of material with insightful observations on the world that these artists inhabit.